Ethiopians rally in solidarity with Prime Minister Abiy Ahmed in Meskel Square in the capital, Addis Ababa, Ethiopia, June 23, 2018. A deadly explosion struck the huge rally for Ethiopia’s reformist new prime minister on Saturday shortly after he spoke. An explosion that killed two people punctured the final moments of a rally for Ethiopian Prime Minister Abiy Ahmed, bringing a flash of violence to what was the largest peaceful gathering in the country’s history. 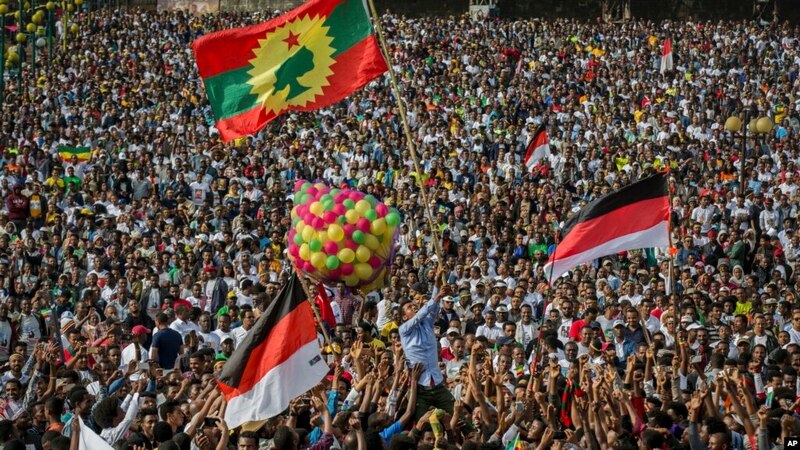 Hundreds of thousands of Ethiopians filled Meskel Square Saturday in the capital, Addis Ababa, in support of Ahmed’s message of mutual understanding and respect. “The movement that has started now for change should continue, and we should all participate. If we don’t have love, peace and unity, we can’t develop our Ethiopia. We can’t grow our society. And if we don’t help each other, we can’t live together,” Haregeweyn Geresu, a rally participant, told a VOA reporter at the event. The jubilant images that emerged from the rally sharply contrasted with the angry, and often violent, protests that have reverberated through Ethiopia in recent years. 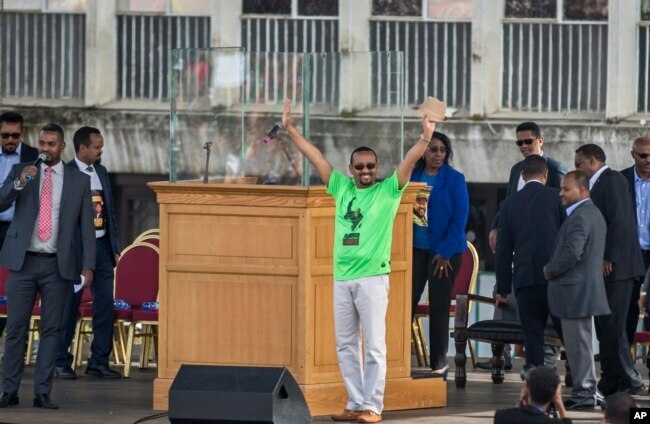 Ethiopia’s prime minister, Abiy Ahmed, waves to the crowd at a large rally in his support, in Meskel Square in the capital, Addis Ababa, Ethiopia, June 23, 2018. Citizens who just months ago may have been protesting their government’s repressive policies and indifference were now celebrating its reforms. The event culminated with a message from Ahmed that acknowledged past grievances, while urging renewal. “The only way to move forward from all the history is forgiveness and love. Revenge is for the weak. And because Ethiopians aren’t weak we won’t need revenge, and we will win with love,” Ahmed told the massive crowd. Speaking in English, an announcer addressed the global audience watching the event. Then, suddenly, a distinctive pop interrupted the speaker, and the group on the platform turned to their right as cries and confusion broke out. Security personnel quickly escorted Ahmed and others from the stage and into a nearby vehicle, tense moments caught on video. The gathering was the largest recorded in Ethiopia, with VOA estimating the crowd approached a half million people. “To tell you the truth, today is a really great day, and I consider it as a resurrection day. I haven’t seen an incident that brought so much joy in my life in Ethiopia. I am here to offer my support with all I have,” Yacob Hailemariam, a renowned lawyer, told VOA. Ahmed has promised a new chapter in Ethiopia’s history. Since assuming office in April, the 41-year-old leader has backed his rhetoric with tangible results: The government has closed a notorious prison, released hundreds of dissidents, lifted a state of emergency, and loosened restrictions on the press and freedom of expression. 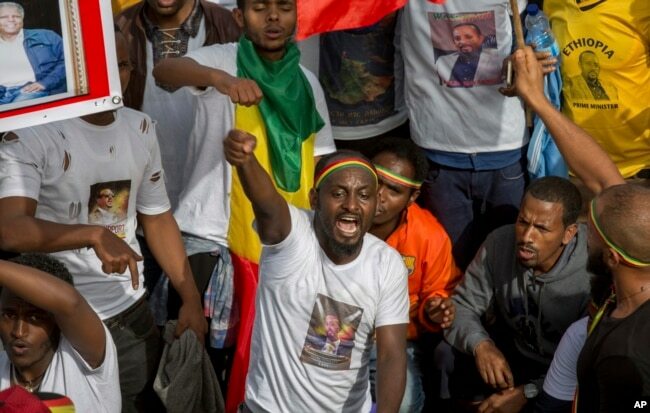 Ethiopians rally in solidarity with Prime Minister Abiy Ahmed, whose photo is seen on a participant’s T-shirt, in Meskel Square in the capital, Addis Ababa, Ethiopia, June 23, 2018. Earlier this year, opposition leaders were jailed for displaying a banned flag. Saturday, rally-goers waved the flag with pride. The blast occurred about 30 meters from the platform where Ahmed sat with other leaders. Amir Aman, the minister of health, told VOA dozens of people remain in the hospital. The exact nature of the explosion has not been confirmed, and no one has taken responsibility, but Seyoum Teshome, an event organizer, called the attack an assassination attempt. “The prime minister was the target,” Teshome told the Associated Press. Zeynu Jemal, the commissioner general of the Federal Police Commission, told VOA’s Amharic Service dozens of people are being investigated, and some of the 156 casualties were caused by a stampede that followed the explosion. “We will continue to expose the people who are trying to mar the progress and good effort … we call on our people to work alongside of the police,” Jemal told VOA. Ethiopian authorities say the capital’s deputy police chief, Girma Kassa, is among those arrested, and other police officers are being investigated for security lapses at the rally. 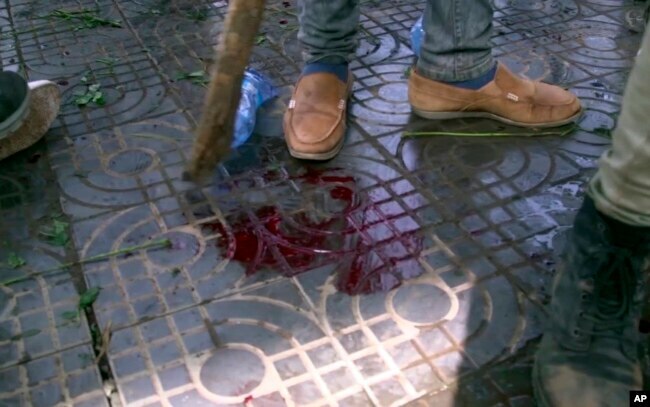 In this image made from video, blood is seen on the ground after an explosion at a rally for Ethiopia’s new prime minister, in Addis Ababa, Ethiopia, June 23, 2018. ​As of Sunday, 30 people had been arrested in connection with the blast, state broadcaster Fana said. But significant challenges remain, and not everyone agrees with Ahmed’s reforms. Efforts for peace with Eritrea, with whom Ethiopia has had a violent and acrimonious history, are far from certain, and the TPLF party, which has held considerable political and military power, has voiced deep concern over plans to cede the border town of Badme to Eritrea in accordance with a 2002 international ruling. But Saturday’s rally shows the reformist leader has amassed considerable support for his vision of Ethiopia’s future. “What we are witnessing today is a miracle. It is a day of miracles. This gives us hope for the future, and nothing that comes after this can compare with this moment,” Fekade Zeleke, a medical professional, said before the blast. Salem Solomon wrote this analysis from Washington. Eskinder Firew reported from Addis Ababa. Tsion Girma reported from Washington.